megabus.com has commenced a new route linking Liverpool and Glasgow - the first direct public transport link service between the two locations. The new service departs Glasgow Buchanan Street at 1130hrs and arrives in to Liverpool’s Liverpool One bus station at 1540hrs. The return service departs Liverpool at 1530hrs and arrives in Glasgow at 1950hrs. The service is part of a wider route that also serves London and Birmingham. The journey time between Glasgow and Liverpool will take about four hours and 10 minutes and is direct, with no stops on the route. .
Fares are on offer on every megabus.com journey from just £1. All services will operate using vehicles with free Wifi, power sockets, air conditioning and a toilet. megabus.com Managing Director Edward Hodgson said: “This new route is great news for our customers who want to travel between these two magnificent cities. Liverpool and Glasgow have always had a close affinity and we’re delighted to be able to announce the first direct link between them. Both Liverpool and Glasgow have previously been crowned European Capital of Culture in 2008 and 1990 respectively. While the vehicles used will branded as megabus.com, the new service is being delivered by the Scottish Citylink joint venture involving Stagecoach and ComfortDelGro. 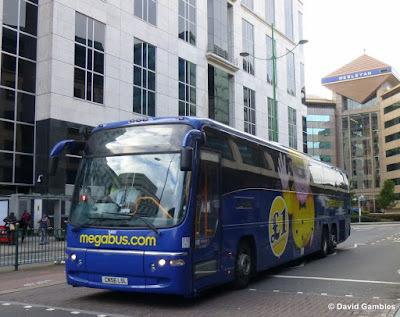 To mark the new route, megabus.com have hosted road shows in each city where the team gave away goody bags and information about the new route.